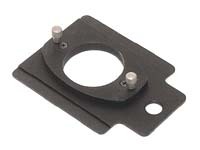 Single Lens Slide-In Lens Mount for use with Omega D-5 and D-6 enlargers. Suitable for use with lenses from 50mm to 150mm. The two lens plate mounting screws are included. In order to attach the lens to the lensmount, the lens must first be mounted on the appropriate lens plate - please refer to our D-5 / D-6 Lens Mount Reference Chart to determine the recommended lens plates for specific lenses.